The diaphragm is a large dome shaped muscle that separates the chest and abdominal cavities. 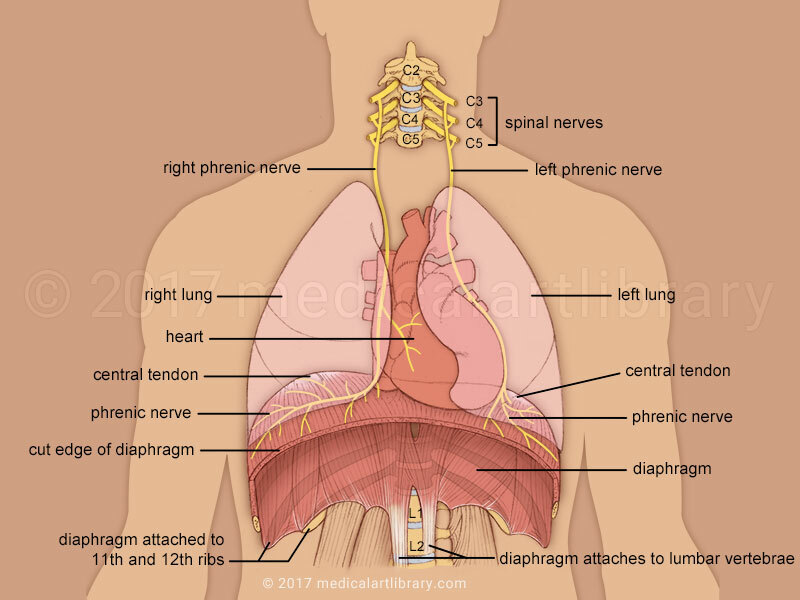 The lower edge of the diaphragm is attached to the inner surface of ribs 6 through 12, the xiphoid process of the sternum and the upper 2 or 3 lumbar vertebrae (L1, L2, L3). The muscles of the diaphragm converge at it’s top in the central tendon. Sitting on top of the diaphragm are the lungs and heart. 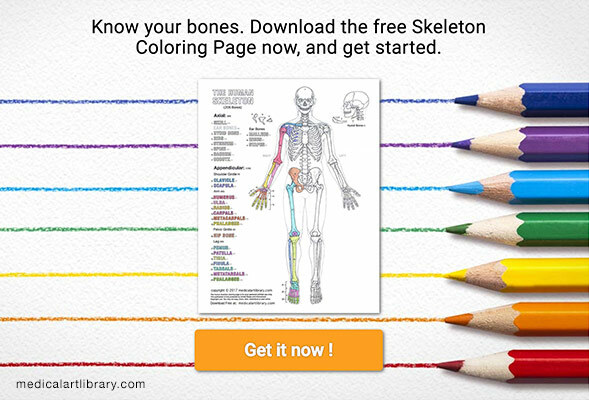 Immediately below are the liver, stomach and spleen. 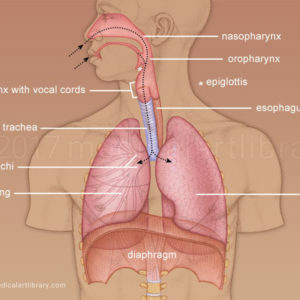 The diaphragm is the main muscle of respiration. Contraction of the muscular portion flattens the tendinous dome of the diaphragm downward and thus enlarges the chest cavity. This allows inspiration to occur by lowering the air pressure within the lungs and allowing them room to expand within the chest cavity. The diaphragm is innervated by the left and right phrenic nerves. The phrenic nerves arise from the 3rd through 5th spinal nerves. Spinal cord injury above the level of the third vertebrae can cause disruption of nerve impulses that travel from the brain to the phrenic nerves. This can cause paralysis of the diaphragm and the need for the injured person to be on a respirator. A spinal cord injury below C5 does not involve the phrenic nerve, thus a person with such an injury can still breath in spite of possible paralysis of the lower limbs.